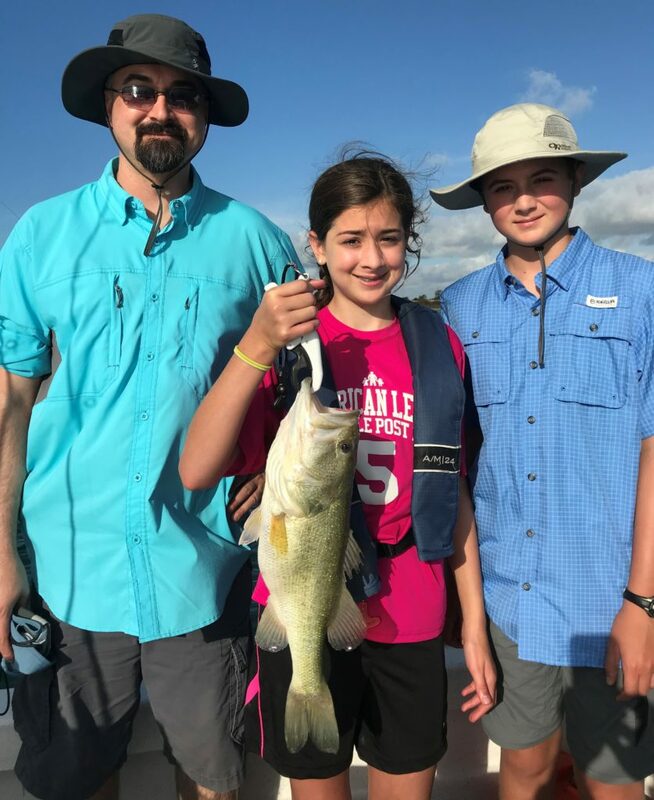 WHO I FISHED WITH: This morning I fished with Mr. David Hudgens of Belton, accompanied by his 13-year-old son, William, and his 11-year-old daughter, Kaylee. David works in the information technology department at McLane’s in Temple, William is headed to 8th grade where he’s looking forward to continuing to play tennis, and Kaylee heads into 6th grade where she will continue to pursue the sport of soccer. This fishing trip was a birthday gift to David from his folks, Bill and Debra Hudgens. Miss Kaylee took the “big fish award” hands down! This nice largemouth went just shy of 4 pounds and came on a Pet Spoon fished at 34′ over a deeper bottom while we were targeting white bass. Although it is difficult to tell from this photo, the bass appeared to have recently fed on a single, large fish, possibly a small white bass, as its abdomen was bulging noticeably out to the sides (look at the tip of the pectoral fin). Although a “triple” eluded us today, the kids landed multiple doubles and singles as the 3-armed umbrella rigs worked their magic behind the Cannons. HOW WE FISHED: We spent our first 90 minutes throwing Cork Rigs to smallish, schooled white bass feeding on young-of-the-year shad in shallow water. 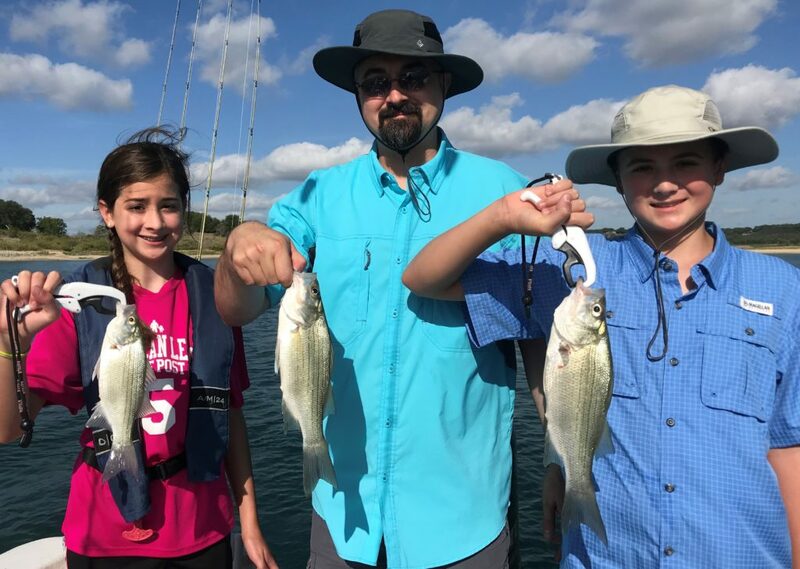 These were young-of-the-year white bass and 1 year class fish, but provided lots of visual, engaging action for the kids and really gave them an opportunity to practice casting with spinning gear under “real-world” conditions. After this action died, we headed to deeper, clearer water to downrig for the remainder of the morning, visiting 3 distinct areas and catching fish at each one. As the lack of topwater action by schoolie-sized largemouth would indicate, the fish were not really jazzed this morning, thus, we had to work for the fish we caught. OBSERVATIONS/NOTES: There was a noticeable lack of topwater action by largemouth bass this morning, hence, to find large concentrations of bait and the white bass hanging near them, we had to visit a number of areas and do a lot of looking with sonar.